Why get a Service Contract? - You can always count on Ra-Jac Sales and Services to quickly respond to your emergency service requirements so why should you consider a preventative maintenance service agreement? The answer is almost anyone can benefit greatly from a maintenance program because it can not only help to prevent many unscheduled visits but it can also save you money over the course of the year in decreased energy costs, fewer and or less severe breakdowns, longer life for your equipment and better air quality which leads to better health and fewer sick days. Like most complex pieces of machinery it needs preventative maintenance to operate effectively and efficiently and consistently. There's no better way to keep your air conditioning, heating and air cleaning system operating smoothly and at top efficiency than with a regular preventative maintenance program. What to Expect - A qualified service technician will come to your home or business site and maintain your system at a prescheduled time. They will perform comprehensive preventative maintenance as well as an in depth inspection of your system for future problems. If there are potential problems the technician will notify you and if you like they can provide service and repairs to fix the problem before it becomes more serious. Why Choose Ra-Jac? 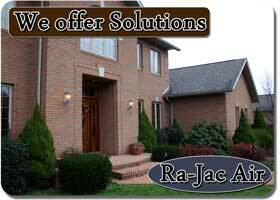 - Ra-Jac air is experienced, honest, reasonably priced and there when you need us. We offer solutions and not more problems. You don't have to be an expert to find answers with us. Let us show you how easy it is to keep your system running smoothly and save money in the process. We are proud to offer Preventive Maintenance Programs that are customized to fit your needs. For more information call us at (409) 945-4171. Contact us for service in the Galveston County and Harris County Area at (409) 945-4171. Please check our coupon page for discount coupons for new Ra-Jac maintenance contract customers. Beware of "Free" Cooling and Heating Inspections - Some air conditioning and heating companies offer "free" or below cost air conditioning or heating inspections. Many times these inspections give the company a foot in the door so that they can encourage you to replace your current unit or do an expensive repair. At Ra-Jac Air, our policy is the same whether we are doing an inspection or have been called in to repair a malfunctioning unit. We simply identify all current and potential problems and advise our customers of all the options available for resolving those problems. It may occasionally be more cost effective over time to replace an old system with a newer more efficient one. We believe that the customer should be aware all of his options and of the cost of each before making a decision. Guarantee of Excellence - We pride ourselves on expertly trained honest and courteous employees, high standards of excellence, and superior customer satisfaction. We are licensed, bonded and fully insured for your protection and peace of mind. Our repairs are backed by a minimum one year warrantee. Extended warrantees of up to ten years are available on certain items. Contact us or ask your service tech for more information. 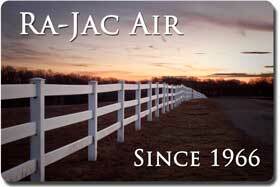 Call us for all your HVACR needs - Ra-Jac Air provides a wide range of services available to the Southern Texas Area. We service Galveston County and parts of Harris as well as the entire Nasa region. 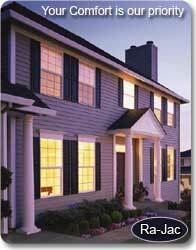 We are licensed and bonded HVACR contractors with over 40 years of experience in the industry. Call us today at (409) 945-4171 for immediate service on Air Conditioning, Heating, Refrigeration, Ventilation, L.P. Boilers, Air Cleaners, Commercial and Industrial, Maintenance Programs as well as other services related to the Air conditioning, heating, ventilation, and air cleaning Industry. To find out more about Ra-Jac check out our company profile or 5 reasons to choose Ra-Jac. Our Texas Service Areas -- If you are in the Algoa, Arcadia, Bacliff, Bayou Vista, Clear Lake City, Clear Lake Shores, Dickinson, El Lago, Friendswood, Galveston, Hitchcock, Kemah, La Marque, League City, Nasa Area, Nassau Bay, San Leon, Santa Fe, Seabrook, Taylor Lake Village, Texas City, Tiki Island, or the Webster Texas areas and want a professional to service, install, or maintain your air conditioning, heating or air cleaning and filtration system contact us at (409) 945-4171. We provide top notch service to keep your home and office air conditioner and heater working efficiently and effectively. Your comfort is our top priority. Please contact us for service or if you have questions. Take the guesswork out of shopping for high quality air conditioning and heating parts for your home or office. We offer only top quality parts that the professionals are using. Let our 40+ years in the air conditioning, heating, ventilation and refrigeration industry work for you. Click here for 10 Reasons to choose Ra Jac as your Air Conditioning and Heating Company for Repair and Installation Service. Ra-Jac Air Conditioning & Heating has proudly served Galveston County TX since 1966. We pride ourselves on providing top notch service on residential and commercial air conditioning, heating, and refrigeration in the Southern Texas area. We offer prompt and courteous service on air conditioning, heating, and refrigeration equipment.